BANGI, 27 December 2014 – Two ministers of Acehnese descent, one a Malaysian and the other an Indonesian, urged Acehnese to bury their hatchets and unite to rebuild their province which was devastated by the Indian Ocean Tsunami 10 years ago. Federal Territories Minister Datuk Seri Tengku Adnan Tengku Mansor and Indonesian Minister for Agriculture and Geography Ferry Mursyidan Baldan said the autonomous province cannot afford the continuation of the conflict which raged on for years before the tsunami struck. Speaking at the launch of the Aceh Tenth Year Anniversary Memorial of the destruction, they called on Acehnese studying in Malaysia to help develop their province when they return home. Some 250 Indonesian students, mostly Acehnese, took part in the memorial gathering here today. The one day event was co-organised by The National University of Malaysia (UKM) Acehnese Students Association and the Acehnese Undergraduates Welfare Education Association. Ferry Mursyidan pledged to put his ministry’s resources at Aceh’s disposal if all Acehnese of all political persuasions unite and work together. He said Aceh had been placed under martial law so as to bring about peace but it had spooked off foreign investors. “What needs to be done after 20 years of the law in Aceh and what will we do now?” he said. He said opportunities abound post-tsunami for enterprising youths in Aceh if they are willing to try. “Aceh has oil, uranium and gem stones. It’s up to you to exploit the natural resources because the province is naturally rich,” he said. Tengku Adnan was more critical of the Acehnese whom he said were divided by politics and religion until the tsunami slammed into the capital Banda Aceh. He said the Acehnese have talents and skills just as their kinfolk who migrated to other countries who had been successful. If the descendants of Acehnese migrants to Malaya could be successful, so could their relatives back in Indonesia. “I am also of Aceh descent. 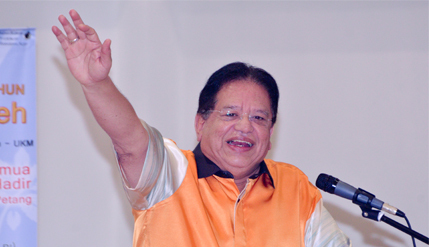 I could become rich before I became a minister,” said the UMNO secretary-general. Tengku Adnan said the Acehnese had been too obsessed with Jihad against Jakarta and of following religious mysticisms like Sufiism. “Why not go on a jihad to build infrastructure and facilities for your province? Why squabble over petty matters and at the same time hope that investors will come?” he asked. He also called on the students to be wary of people seeking to recruit Muslims to fight for the so-called Islamic State in the Levant. Also present at the gathering were Deputy Vice-Chancellor (Industry and Community Partnerships) Prof Dr Imran Ho Abdullah, Indonesia’s ambassador to Malaysia Herman Prayitno, President of the Acehnese Community Malaysia Hj Mansyar Usman and Chairman of the event’s organising committee Muhammad Yassar.